Connections and Dots – Let Them Eat Kale/Carrots…or Cake? Some say no meat for 7 days…(me, the carnivore, craved a piece of chicken after 5) . Some say yes, you can eat lamb which is lean, some say no meat, only fish and chicken. And god forbid you should eat grains with meat and vegetables…lightning will strike…eat either grains with vegetables, or meat with vegetables. Wild or farmed fish? What to do? Then there are the night shade vegetables that produce swelling. These pro-inflammatory substances are enemies of arthritis. They are potatoes, tomatoes, tomatillos, eggplant, sweet and hot peppers, paprika, pepinos, ground cherries (sweet potatoes, yams, and black pepper not included). The recent AARP magazine listed the foods to beat cancer. Tea and coffee have antioxidants, curry which has turmeric, tomatoes block malignant cells from multiplying, garlic and onions repair damaged DNA, milk (studies show that milk drinkers are not obese and therefore maintain a healthy weight), broccoli and other cruciferous vegetables, dark leafy greens…kale, spinach, romaine has antioxidants called carotenoids, red grapes and red wine are loaded with resveratrol, whole grains also help with preventing heart disease and hype 2 diabetes. Apples contain cancer inhibiting compounds, a handful of nuts every day also prevents heart disease, and beans and lentils filled with fiber prevents cancer to our colon. 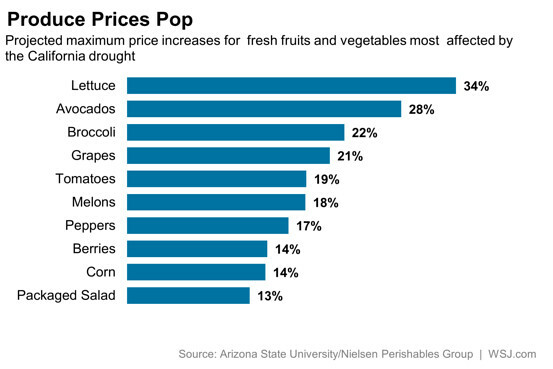 Because of the drought in California we will be paying more for our fruits and vegetables. Farmers will have to decide which crops to water and which ones they will let fall away. All the benefits of our back yard vegetable patch might save us a buck or two. Now that everyone is keyed into the conversation of health I decided to check on the top sellers of grocery stores. Trader Joe’s most popular items (with their cult following) is all about the sweets. Triple ginger snaps, speculoos cookie butter, Joe’s cookies, mac ‘n cheese, pumpkin butter, almond butter, cranberry goat cheese log, pumpkin bread and muffin mix, rosemary macron almonds, corn and chili pepper salsa, dark chocolate covered almonds, chocolate orange sticks, chili lime chicken burgers, gouda. Aren’t we supposed to NOT eat sugar? Only honey or agave? Whole Foods which I go to VERY DAY is in an article released this week in Fortune. The successful natural food retailer is expanding into new and unexpected markets, and changing the way the country eats, one kale smoothies at a time. I am a fan of their 365 line (2,000 sku’s) which is keeping them price competitive and merchandised by category with the other brands so you have a choice. They are not so elitist. I like their philosophy. WOMEN IN THE NEWS: Elizabeth Warren just released her book ‘A Fighting Chance‘. A Tale of Two Elizabeths described her as a down to earth Okie and Washington power broker. Ironically Hillary Clinton was in Boston last week speaking at Simmons College looking very presidential and urging women to ‘dare to compete’. Hillary’s new book ‘Hard Choices‘ will be released in June. TODAY’S FASHION: I’m a brat…I’m at a spa…Rancho La Puerta, and what is everyone wearing? My new favorite line Athleta. The fit is great, the price is right (its a Gap brand) and everyone is wearing it! Lucy is also popular as is the TJX knock offs of LuLu. I’m not bashing Lulu, but they did loose their market share to others. Tory Burch is coming out with an athletic line of clothing…did not take her any time to see the hole and jump in. Smart gal! I guess I will just do what I do and stop being confused…eat what tastes good, and make small adjustments…and feel good and look good in my workout clothes. Kale Salad (blog feature photo) served at We Olive in La Jolla, Calif. Kale shredded, shaved asparagus, , dried cherries, some cheese, dressing is basil olive oil and peach white balsamic. Cherries are marinated in the peach white balsamic too. Yummm!